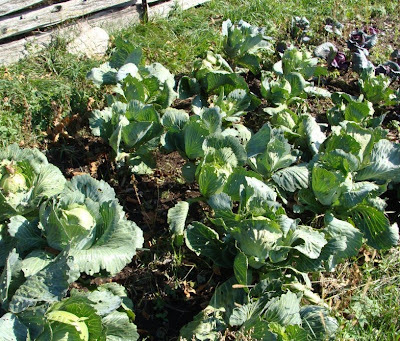 I've been a bit haunted by the Bucket family's diet lately, as the cabbage crop has been the runaway success (I'm not sure if that is actually the right word) of this year's vegetable garden. I've already blogged about the sauerkraut I made in the summer. 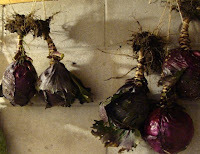 On Friday I pulled up a lot of the remaining cabbages. Many are hanging by their roots (that sounds terribly cruel doesn't it?) in the root-cellar part of our basement. 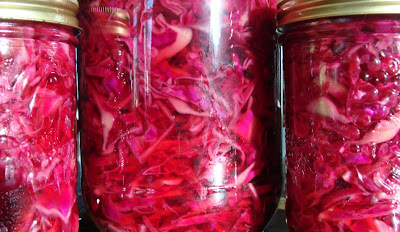 I like plain boiled cabbage, and cole slaw -- not at the same meal -- and your pickled red cabbage would really make a winter meal perk up, colorwise as well as tasty. I have always loved pickled red cabbage. That is a lot of cabbage. I think I'd eat coleslaw everyday. Well maybe not every day. I love it now, but if I had it every day I think I'd get sick of it. And then there's swede . . . and swede . . . and more . . . Yes, coleslaw has the benefit of being something that the whole family will eat, so there will be a lot of that this winter. I also tried braised cabbage (chopped cabbage cooked with butter and a little water in a covered pan for 30 minutes on a low heat) yesterday and both the children liked that too, so perhaps the surfeit of cabbages isn't going to be too impossible to consume!